Description This Fayetteville, Georgia hotel has an outdoor pool, free internet access, non-smoking guest rooms and free breakfast. This hotel is also pet friendly. An outdoor pool free hot breakfast and rooms with free Wi-Fi and refrigerators top the amenities at the Holiday Inn Express Fayetteville. The 60 rooms at this two-story hotel with an antebellum-style wraparound porch feature free Wi-Fi cable TV refrigerators and coffeemakers. Rooms with microwaves are available. Guests can enjoy the free hot breakfast with egg dishes sausage bacon and cinnamon rolls to start the day. There's a seasonal outdoor pool where guests can relax on the sun deck after a long day. A 24-hour business center is convenient for guests who need to work. Pets are allowed for a fee. Hartsfield-Jackson Atlanta International Airport is 15 miles away. The hotel is less than a five-minute walk from Fayetteville's quaint downtown with a popular amphitheater for outdoor summer concerts and the oldest courthouse in Georgia. The Atlanta Motor Speedway is 14 miles away. Downtown Atlanta attractions such as Georgia Aquarium and the World of Coca-Cola are 25 miles away. 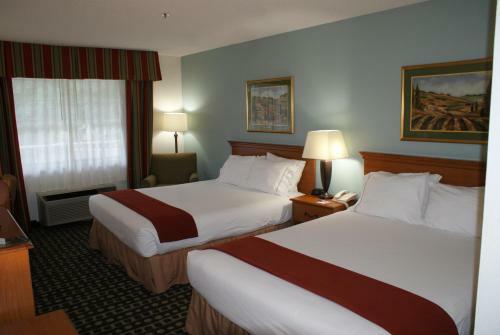 Add Holiday Inn Express Fayetteville to your free online travel itinerary.